I regularly seek opportunities to create synergies between teaching, research, and service — and this is one of the best examples: Advised by the JMU Center for Service Learning (CSL) in 2012 and 2013, Rebecca Simmons (COB) and I mentored student projects for HON 300/ISAT 680 (Quality and Process Improvement in Action). Many of these yielded tangible benefits for the local businesses and community agencies we served. In addition, each year our students subcontracted project teams from my ISAT 341 (Simulation & Modeling) sections, enhancing the learning experience for students in both classes and creating a powerful synergy between teaching and service. Students recorded videos and narrated Powerpoint presentations to discuss the impact of their contributions, and we brought those to a special session that we created for the Young Quality Professionals (YQP) at the 2012 World Conference on Quality and Improvement (WCQI) in Anaheim, CA (see picture at left). In addition to capturing the learning experience as scholarship, this was the first conference presentation for most of the students. Their videos provided powerful inspiration to approximately 50 students and educators in the audience, many of whom had never considered the opportunities provided by a service learning pedagogy. a) A contribution which applies the resources of the University to solving a problem of local, regional, state, national, or international concern. I also served as a tour guide for junior high and high school students in 2011 and 2012 for the Charlottesville Business Innovation Council’s (CBIC) Tech Tours. This provided me the opportunity to share the spirit of ISAT with students across Virginia, while engaging in conversations about school interest and potential career paths. Most of the students were from disadvantaged or underrepresented groups. During Spring 2014, I also participated in the Advisory Committee to create the ASQ Social Responsibility Body of Knowledge (BOK) which will be used as the basis for certification programs. This integrates the tenets of the ISO 26000 Guidance on Social Responsibility, which I helped to develop in 2007 and 2008, with the principles of quality management. b) A major effort to solve a problem at the local, state, national, or international level providing a significant benefit to society and in an area directly related to one’s professional expertise. Between 2007 and 2014, most of my contributions to the National Science Foundation (NSF) have involved identifying ways to better employ principles and practices of quality management (my expertise) to develop more effective strategies for large scale research facilities. Although the financial impact of my recommendations to NSF projects have not been tracked, I have certainly catalyzed improvements in required time, effort, and funding to achieve the objectives of NSF and its funded research facilities. In 2011, I was invited to serve as a consultant to the “Managing Cyberinfrastructure Centers” project led by Nick Berente at the University of Georgia. The purpose of his initiative is to collect stories, lessons learned, and techniques for improvement from major federally funded research and development centers (FFRDCs) to systematically improve the allocation and use of federal funds for research infrastructure. I also created and delivered a workshop entitled “Quality Tools for Problem Solving” at the Expanding Your Horizons (EYH) conference (to stimulate interest in STEM fields for girls in grades 5-10) on March 24, 2012. Based on the letter of acknowledgement from the event organizers, my “workshop was rated highly on many conference evaluation forms, and several students commented specifically about how much they enjoyed the session.” I was invited back to the March 16, 2013 event to conduct the workshop again. c) A major service or office at the local, state or national level related to one’s professional competence. I have not held services and offices related to my professional competence outside of my professional societies (ASQ, SPIE, ATMAE). d) Other professional service directed at the betterment of society which the PAC deems to be a significant contribution. 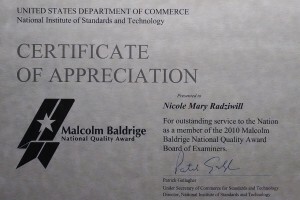 My most notable professional service activity that is geared towards improving society has been serving as a National Examiner for the Malcolm Baldrige National Quality Program (MBNQP) in 2009 and 2010. The appointment is made by Congress and the program is administered by the National Institute of Standards and Technology (NIST). Designation as an Examiner is a high honor in the quality profession. Examiners participate in a week-long training session each year on the Baldrige Criteria for Performance Excellence, and then spend 100-120 hours achieving consensus on an organization’s compliance with each of the ~200 sub-elements of the criteria. This process helps to build the capabilities of applicant organizations by providing detailed feedback on strengths and opportunities for improvement, particularly in aligning strategy with objectives, achieving quality, and managing performance, and ultimately helps to improve competitiveness. I reviewed applicant portfolios from healthcare and manufacturing organizations. In 2008 and 2011, I was selected by peers within my professional community to serve as a Preliminary Round Judge for the American Society for Quality (ASQ) International Team Excellence Awards (ITEA), a quality award program with criteria that is loosely based on the Baldrige program. I will probably also serve in 2014. “Judging” this event is complex, and involves a systematic process to generate consensus and a written feedback report to each team that is evaluated. The benefit of this contribution is that it enables the judges to educate applicants while promoting best practices for effective teamwork, quality management, and increasing innovation.